The ‘sound’ is led by ensemble founder Kyam Allami, playing the oud, the traditional fretless string instrument which is the basis of middle eastern music. 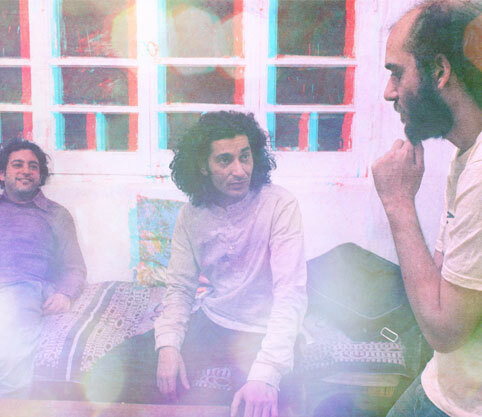 Add to that the buzuk, mastered by vocalist Tamer Abu Ghazaleh, the the rest integrates the already widely familiar – bass guitar (Khaled Omran), two percussion players (Ayman Mabrouk and Kaled Yassine) with Yaroub Smarait on violin and Maurice Louca on keyboards. Indeed, when also operating the mixing desk, Louca’s bodily animation communicated enthusiasm for a sound world which, frquently, could easily have crossed over into the realms of mid-period Pink Floyd.